Adventure community, one of our own needs our help. Steve Alexander isn’t just the co-founder of Infamous Quests, designers of Quest for Infamy and Order of the Thorne (as well as the fan remakes of King’s Quest III and Space Quest II done by Infamous Adventures), he’s an all great guy, good friend, an incredibly …and facing some very tough times to come. Steve will soon have to undergo a third kidney transplant surgery, this time donated by his amazing wife Jordan (whom you may know as the Angry Splash Mountain Lady!). Steve’s friends have organized a GoFundMe to support him and his family during this time. You can read more about Steve’s journey, diagnosis, and what the money will used for at that page. 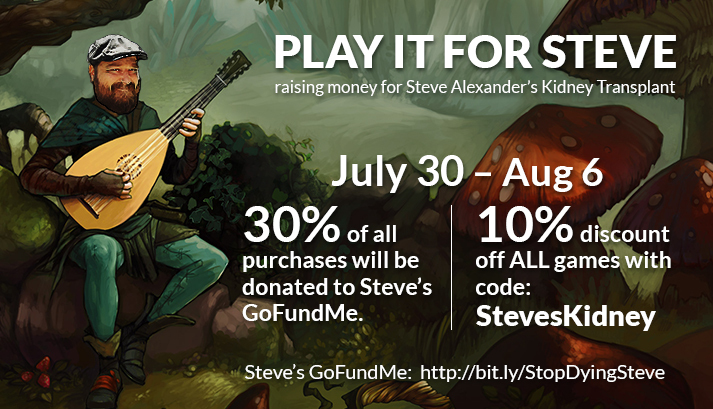 For the next week–July 30th through August 6th–Phoenix Online will be donating 30% of all sales in our store to support Steve! That’s 30% of ANY game, and you can also save 10% on your purchase by using the coupon code StevesKidney. Please help support Steve in whatever you can–buy a game, make a donation, or just by sharing the link for the GoFundMe. Whatever you can do will be greatly appreciated and go to a great cause!